Tickets: At Fabric Salon, Vale Street Cooma and at the door. 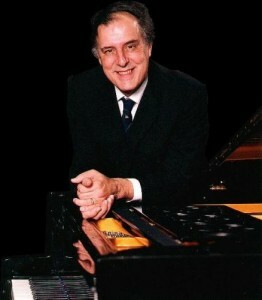 Mr. Rudnytsky is an American pianist of international renown. He has been something of a roving musical ambassador for the last 26 years, playing concerts and conducting master classes under the auspices of U.S. Embassies in over 35 countries around the world. Born in New York into a prominent Ukrainian musical family, Mr Rudnytsky began studying piano at the tender age of four and gave his first full recital at age seven. 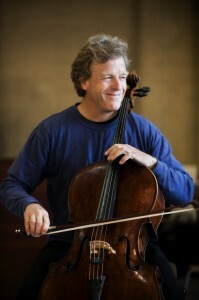 He is a graduate of the luilliard School in New York. 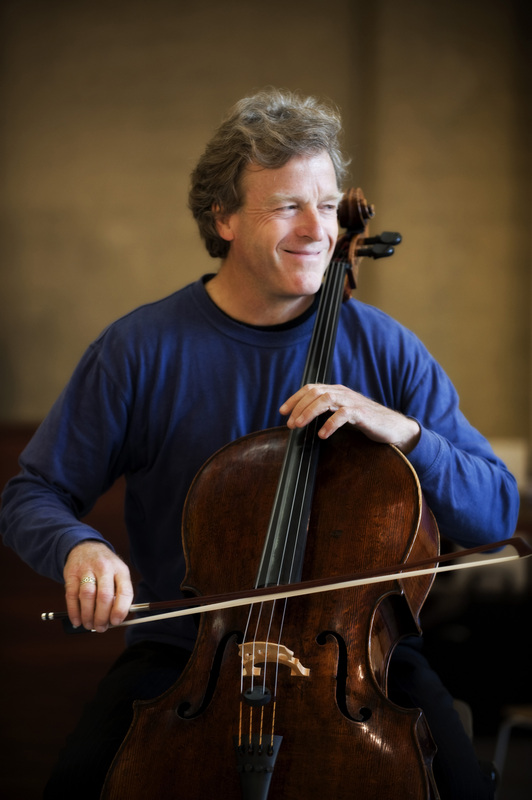 He also studied at the Peabody Conservatory in Baltimore, Maryland, and at master classes in Austria and Italy. Mr. Rudnytsky earned prizes in ten piano competitions, including such prestigious events as the International l.S. Bach competition and the International Leventritt Competition. He has made numerous recordings in the United States, Poland, and Australia. 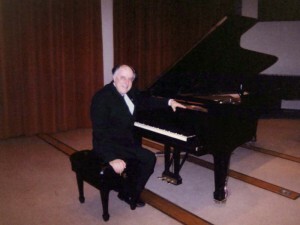 Since 1972, Mr. Rudnytsky has been a member of the piano faculty of the Dana School of Music at Youngstown State University in Ohio, and is a recipient of that institution’s Distinguished Professor Award, a testament to his love of learning and commitment to honing the musical talents of new generations of musicians. He has also served on the piano faculties of the Indiana University School of Music and the University of Cincinnati College Conservatory. This entry was posted in Concerts & Events, Snowy Monaro Arts Council and tagged piano concert, Roman Rudnytsky on July 28, 2011 by allan. David Pereira (Cellist) with Glenyss Allen (Piano) in a “Grand” Welcome Concert to the new piano. 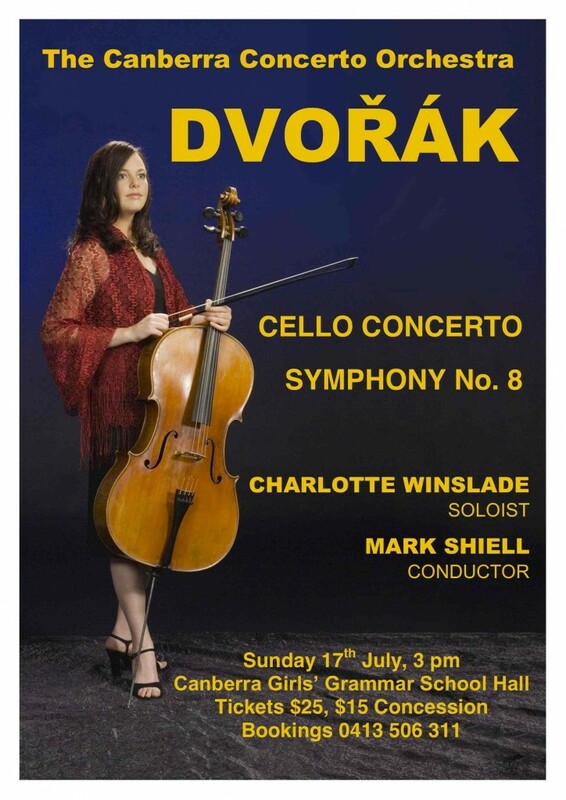 This entry was posted in Concerts & Events, Snowy Monaro Arts Council and tagged Cello & Piano Concert, David Pereira, Glenyss Allen on July 28, 2011 by allan. 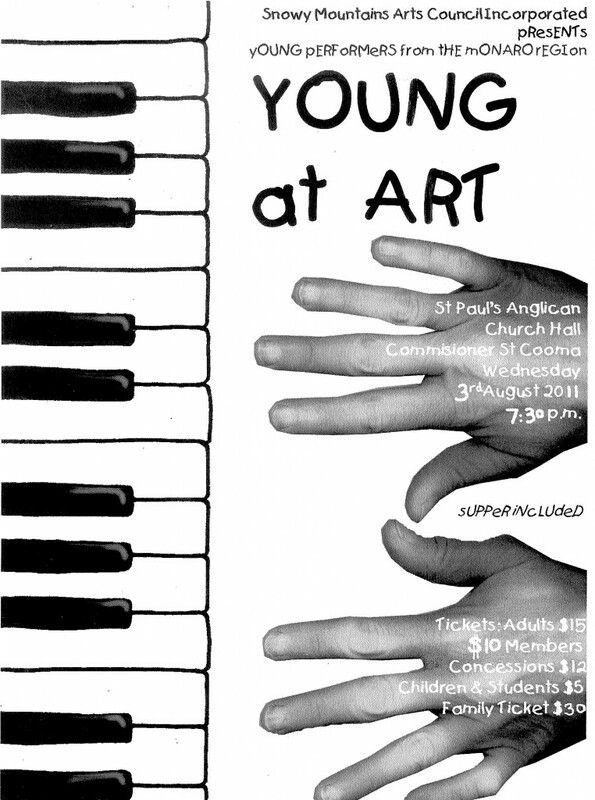 Snowy Monaro Arts Council Inc. is proud to present Young @Art 2011 on Wednesday 3 August. Starting at 7:30pm, cheap this recital features performances by a number of young, pathopsychology local musicians. There will be a mix of items, prostate from solos and duets through to ensembles, including the 14-member-strong Snowy Mountains Ensemble. The performers will play piano, woodwind, brass and string, and more, with pieces ranging from classical to ragtime to contemporary. 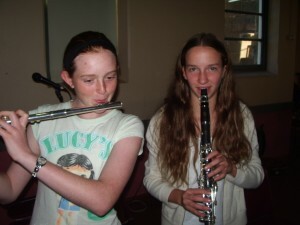 The annual Arts Council’s Young @ Art project provides an opportunity for talented young people from the Cooma-Monaro area to gain experience playing for a discerning audience. This year, the pianists and accompanists will have the honour of playing the Arts Council’s brand new grand piano, installed atthe venue, St Paul’s Anglican Parish Hall only weeks ago. Tickets to Young @ Art 2011 are available at The Fabric Salon, Cooma as well as at the door from 7:00pm on the day of the concert. This entry was posted in Concerts & Events, Snowy Monaro Arts Council and tagged snowy monaro arts council inc, Young At Art on July 27, 2011 by allan. 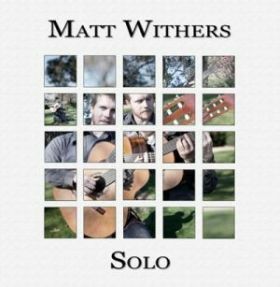 Renowned classical guitarist, ampoule Matt Withers will be performing in Cooma in October this year as part of his “Solo” CD tour. Matthew Withers is a Masters graduate of the Australian National University (ANU) School of Music where he studied Classical Guitar Performance under the renowned performer and pedagogue, Timothy Kain. 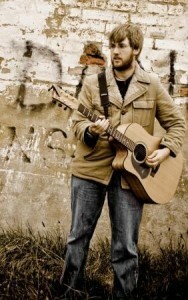 Matt has given performances throughout Australia and internationally. In 2010 he travelled to Shanghai to perform at the World Expo. Here he was featured in the Australian Pavilion as part of their VIP Rising Star program. As part of both Guitar Trek and Brew Guitar Duo, Matt has given live, nationwide broadcast concerts for ABC Classic FMs Sunday Live Program. 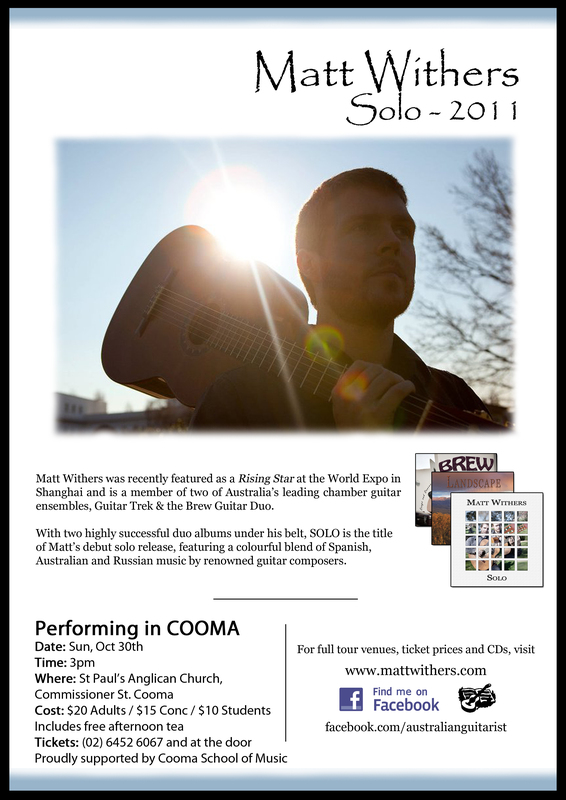 As well as launching his performing career two of Australia’s leading chamber guitar ensembles, Matt has had considerable success as a soloist. 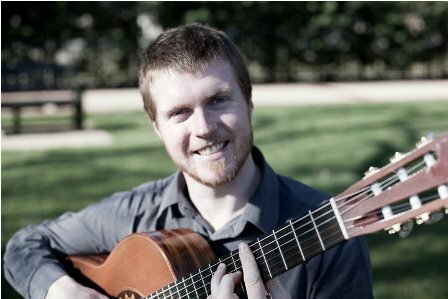 After learning classical guitar for only 4 years, he won the title Best Young South Australian Guitarist in the Australian National Open Guitar Competition. In 2006, he was placed first in Open Solo event of the McDonalds Performing Arts Challenge and was a semi-finalist of the 2010 Adelaide International Guitar Festival. Matt is an artist of diverse talents. He has become proficient as a recording technician whilst working as the assistant to Niven Stines (Technical Manager) at the ANU. 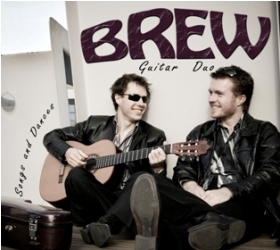 In this role, Matt has recorded many quality guitarists including Timothy Kain, Harold Gretton and Minh Le Hoang as well as two discs for the Brew Guitar Duo and his recent debut solo album. Matt studied in Adelaide under the successful classical teacher, András Tüské, prior to his tertiary studies. 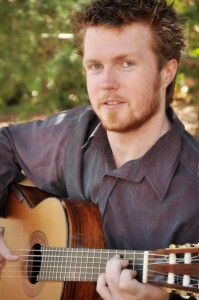 During this period, he also participated in the Suzuki Autumn Schools and became a role model for the younger players as leader of the South Australian Youth Guitar Ensemble. 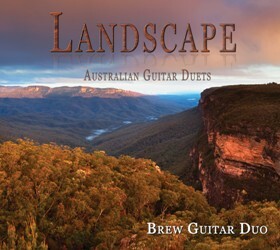 This entry was posted in Concerts & Events and tagged Brew Guitar Duo, classical guitar concert, Matt Withers on July 17, 2011 by allan. This entry was posted in Concerts & Events, Cooma Harmony Chorus on July 14, 2011 by allan. This entry was posted in Concerts & Events on July 7, 2011 by allan. This entry was posted in Concerts & Events, Our Music Community on July 6, 2011 by allan.